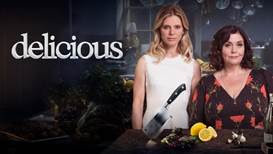 Acorn TV exclusively features the return of British drama "DELICIOUS," Series 2 with its U.S. Premiere on March 5. This four-part drama about food, love and infidelity in Cornwall returns starring Dawn French (The Vicar of Dibley) and Emilia Fox (Silent Witness) with Iain Glen (Game of Thrones, Downton Abbey, Jack Taylor). Joining the cast for Series 2 is Franco Nero (Camelot, Django, Die Hard 2) as the father of Gina Benelli (Dawn French). Called a “glorious streaming service… an essential must-have” (The Hollywood Reporter), Acorn TV is North America’s most popular streaming service specializing in British and international television from RLJ Entertainment (NASDAQ: RLJE). The Penrose Hotel is growing in reputation and Gina (Dawn French) and Sam (Emilia Fox) are two women on top. Great success, however, can attract unwelcome attention from the most unexpected places. When Gina’s estranged father Joe Benelli (Franco Nero) walks back into her life, he brings all the painful memories of Gina’s past with him. Are Joe’s intentions as honest as they seem? Or is Gina right not to trust a word he says? New chef Adam (Aaron Anthony) has the talent and potential to be Gina’s protégé, but is he hiding a dark secret? Sam’s desire to regain her own independence threatens to derail her relationship with Gina. Are these two capable of a working relationship? Leo’s voice still echoes through the series from beyond the grave. When Leo upped and died, he left his family with a lot of lemons - all they can do now is find new and imaginative ways to make lemonade.